Whether you are a sports fan or just looking for something unique, you can enjoy the best day of your life at Ashton Gate Stadium! Offering unique photo opportunities and an experience you and your guests will never forget we can make the best day of your life become a reality. We are licensed for civil ceremonies so you can have the whole day with us and let us take care of everything! 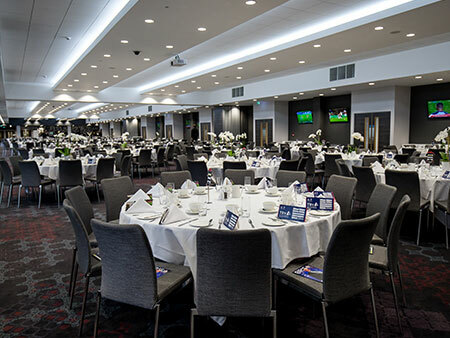 Whether you choose to have a small intimate ceremony or invite all your friends and family to celebrate with you, Ashton Gate Stadium is the perfect venue for you. We are licensed for civil ceremonies in our Dolman Lounge, Directors Box and Heineken Lounge. Ceremony room hire charge of £550. Add the Drinks Package @ £15pp to include ½ bottle wine with the meal and a glass of sparkling wine with speeches. Upgrade to a hot fork buffet @ £5 per person supplement. We are proud to work alongside award winning Asian caterers, Aagrah, to offer Asian Weddings in our Lansdown Restaurant for up to 850 guests. Whatever the occasion, whatever your party size, whatever your ‘hospitality dream’, Aagrah will make it happen! They have created a specialised and dedicated team to advise you on all aspects of your menu and banqueting set up to ensure that your day is perfect. Not only will Aagrah provide the finest catering, they can also help with limousine services, venue décor and wedding cakes! Please contact the events team at Ashton Gate Stadium and we will provide a bespoke package based on your requirements.